Enlarge The terminal plate is made of sturdy ABS plastic. 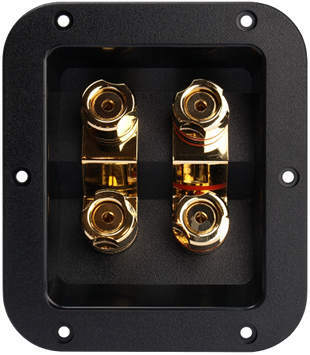 For attaching the plate to the cabinet 3.5 mm PAN screws should be used. Enlarge This ABS terminal plate shows square shape. 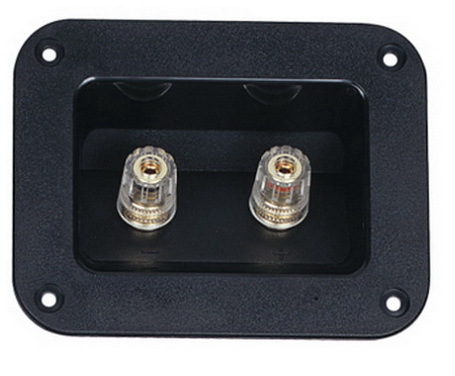 The terminal plate is made of sturdy ABS plastic. 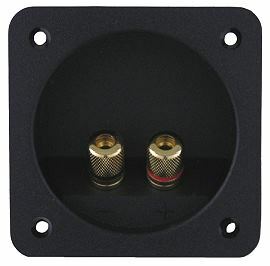 For attaching the plate to the cabinet 3.5 mm PAN screws should be used. 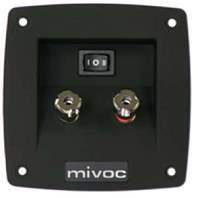 This rectangular terminal plate needs little space and the cut-out with a compass saw is easier. It's available with binding posts with metal screws. Enlarge This rectangular terminal plate is of high quality, the cut-out with a compass saw is easy to be done. It's available with insolated binding posts made of brass. 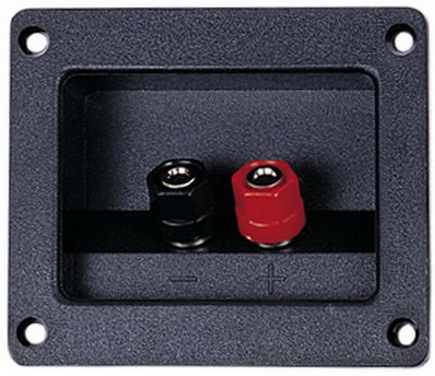 Enlarge This rectangular terminal plate is delivered with insolated binding posts. 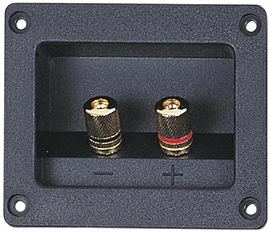 Enlarge This terminal plate with four binding posts is suitable for bi-wiring (tweeter and woofer are connected to the amplifier separately). The plate is made of sturdy ABS. 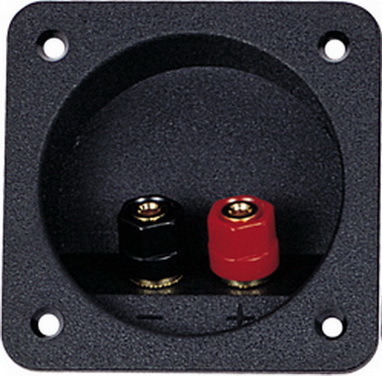 Suitable for mounting are 3.5 mm PAN screws. 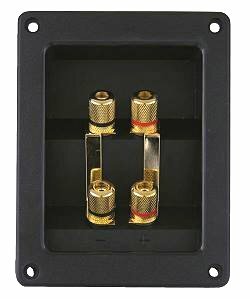 This terminal plate with four binding posts is suitable for bi-wiring (tweeter and woofer are connected to the amplifier separately). The plate is made of sturdy ABS. 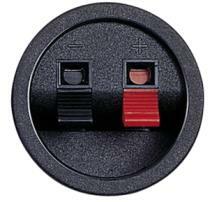 It's available with binding posts either with metal screw (pictured) or plastic covered crew. 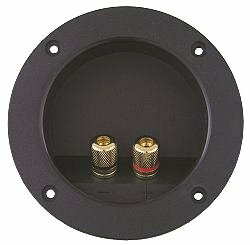 Suitable for mounting are 3.9 mm tallow-drop screws. 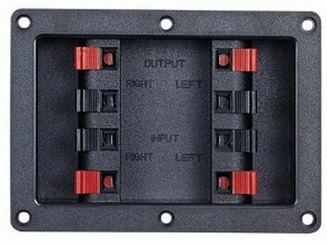 Enlarge These two ABS terminal plates are equipped with spring-loaded push connectors. The upper model T56 D is circular and snaps into a cut-out of 48 mm diameter. 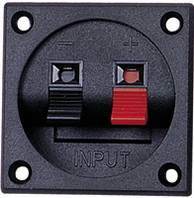 The lower one is square and can be attached with 3.5 mm countersunk screws. 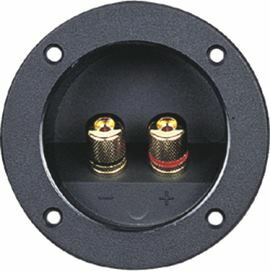 Enlarge Subwoofer or multi-wiring (drivers are connected to the amp separately) terminal plate, made of platic.